Nashville, TN -- Four time Emmy-award winner Nic Dugger and his mobile production company TNDV will produce the second season of the PBS series Bluegrass Underground, bringing the luminaries of bluegrass music heard on the live radio program to televisions around the country. The shoots take place in late February, with 2012 air dates to be announced. 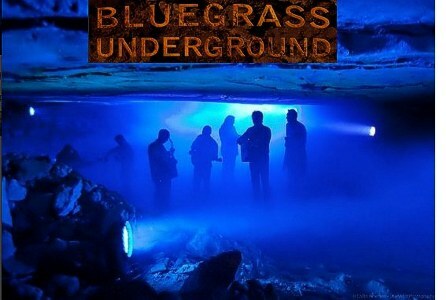 Bluegrass Underground's concerts are held in the Cumberland Caverns, a series of underground caves more than 300 feet below the earth's surface in Tennessee. After a successful first season, TNDV and the Bluegrass Underground have again joined forces to bring production and acoustical excellence to the show's live performances from the Volcano Room. The Volcano Room is a natural amphitheater, carved from the flow of two underground rivers to create one of the most acoustically pure and breathtaking natural spaces in the world. To get to the concerts, tour guides lead patrons through the cave and down 333 feet. The subterranean descent includes underground waterfalls, water pools, stalagmites and stalactites along the way to the amphitheater, where fans enjoy bluegrass music in a unique and beautiful venue. Nashville-based TNDV, noted for building television and video productions in unique and remote locations, will provide the HD mobile production systems and technical crew needed to produce the events. TNDV's Aspiration, the company's 40 foot expanding-side mobile production truck, will support the remote video and sound production services for broadcast radio and TV. Aspiration will park near the cave and deploy and an advanced SD/HD/3D production workflow featuring seven cameras, a full audio suite, and extreme cable runs. Every camera will use 1000 feet of fiber-optic cable to record and broadcast each concert. Aspiration's utilization of fiber-optic cables from camera to truck ensures no loss of signal, color, or sound to maintain quality throughout the process. Amplifiers located near the stage feed directly to the truck over a digital audio line to generate a mixable, superior-quality audio signal for the TV program. "Producing an international television series from 333 feet underground takes a lot of creativity and a team with a can-do mentality," said Todd Mayo, producer, Bluegrass Underground. "TNDV and Nic Dugger bring creative solutions to logistical challenges and a positive attitude to bear in all they do. When you combine a track record of excellence with a team of good people that add value to any project, you are way ahead of the curve in producing quality television." PBS will broadcast the second season of Bluegrass Underground featuring live performances from bluegrass music stars later in 2012. Bluegrass artists for the 2012 Season include Vince Gill, The Civil Wars, Jerry Douglas, Del McCoury Band and The Time Jumpers. Formed in 2004, TNDV: Television represents the culmination of many years of broadcast and live production for Nic Dugger, owner and president; and his talented crew of freelancers throughout the country. TNDV produces events from small single-camera productions all the way up to multi-million dollar international TV events, and takes pride in building custom solutions for challenging productions of any size, in any situation. TNDV specializes in creating productions that are of the highest quality while being ultra-mobile and always professional. Recent productions include The Americana Music Awards, Extreme Makeover Home Edition and the Madden Challenge, live from the 2012 Super Bowl Village in Indianapolis. Please call 615-585-6528 or visit www.tndv.com for more information.